Hi! I'm Nidia, and I run a little blog called Lit From Within. Do feel like when there's a substitute blogger, you're back in grade school, and that means you don't have to pay attention anymore? Crazy, right? Well, this is ColorMeSoCrazy, so I guess I have the right place! 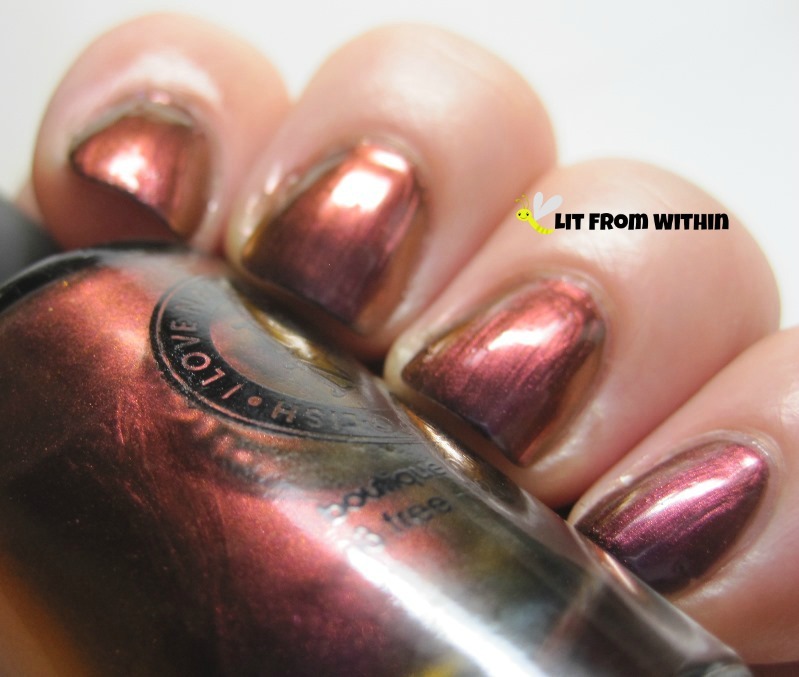 And the right polish - this is I Love Nail Polish Undenied, an amazing multichrome. But wait, there's more - do you like glitter? I have glitter! 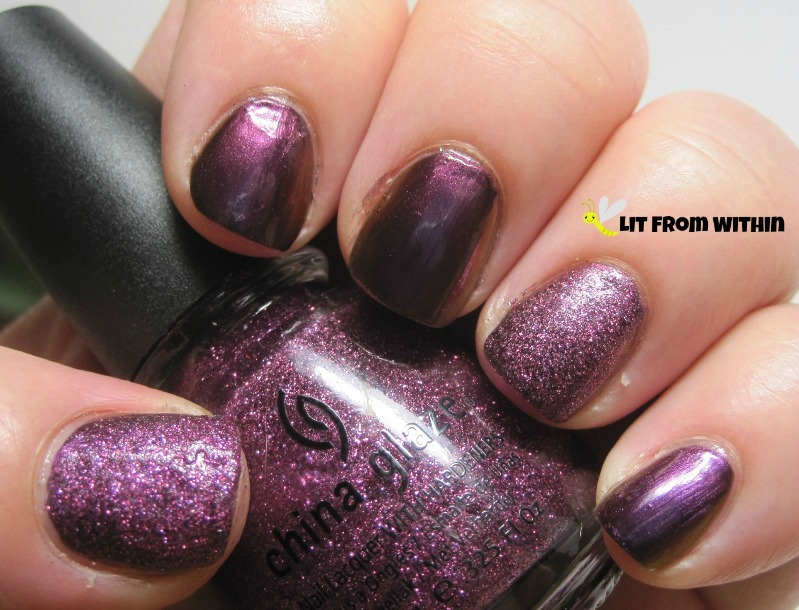 This is China Glaze Put A Bow On It. I love how it brings out more of the purple in Undenied. But, wait, there's more! If you act now, we'll double your order... um, I mean, there's flowers and scrollwork! 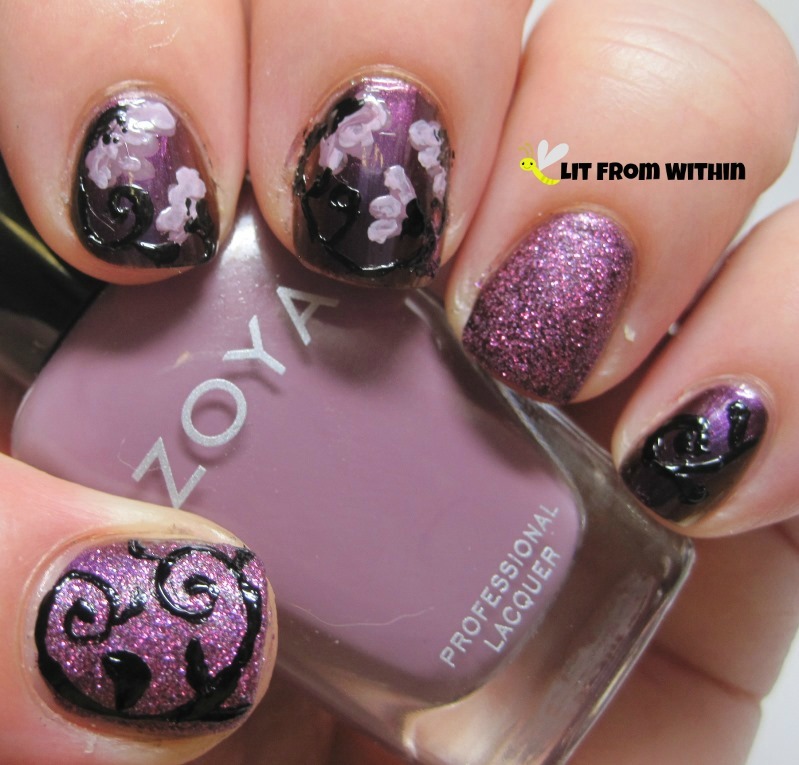 I used Wet 'n Wild Black Creme for the scrolls and Zoya Odette - both by itself and mixed with a little Revlon Spirit - for the flowers. You like shiny? 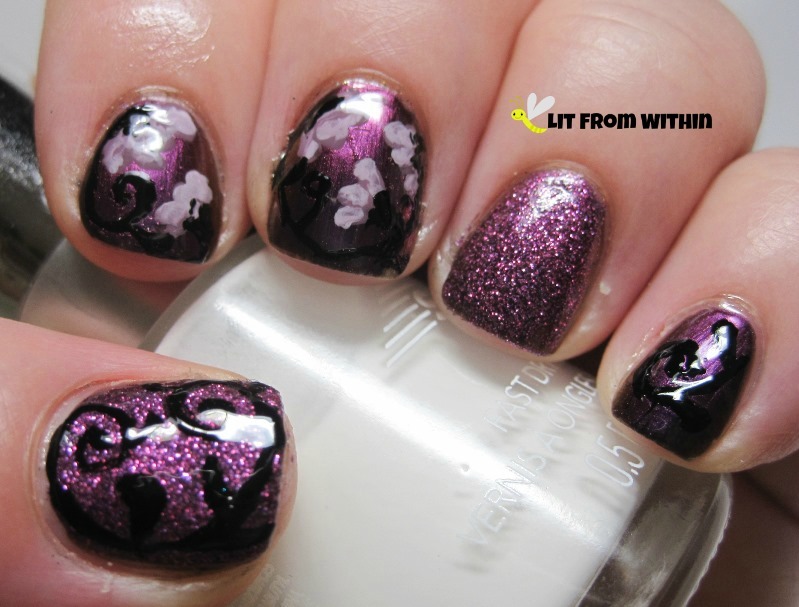 Add a little topcoat to make everything shiny and seal in the nail art. And, we're done! 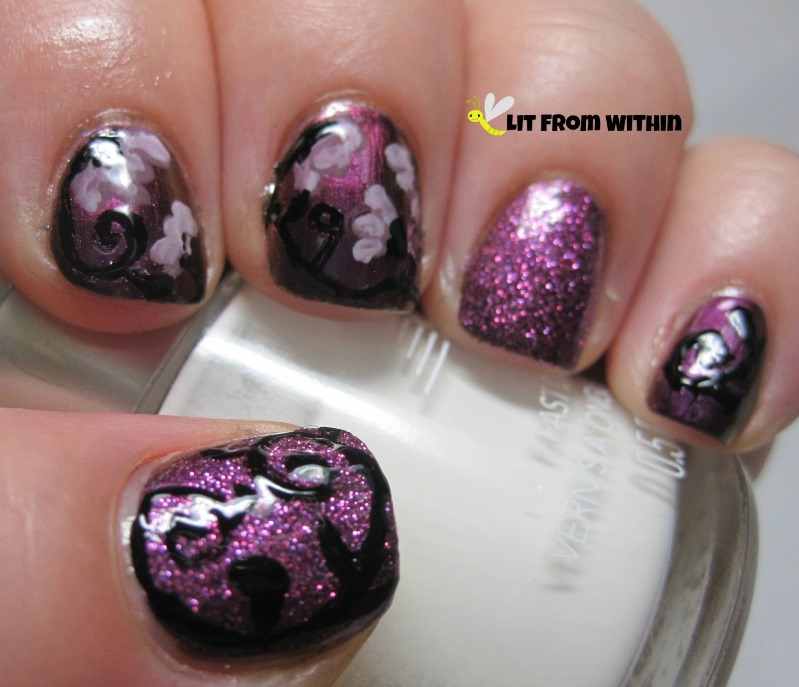 It's a real hodge-podge of nail art, but the color pulls it all together for me. 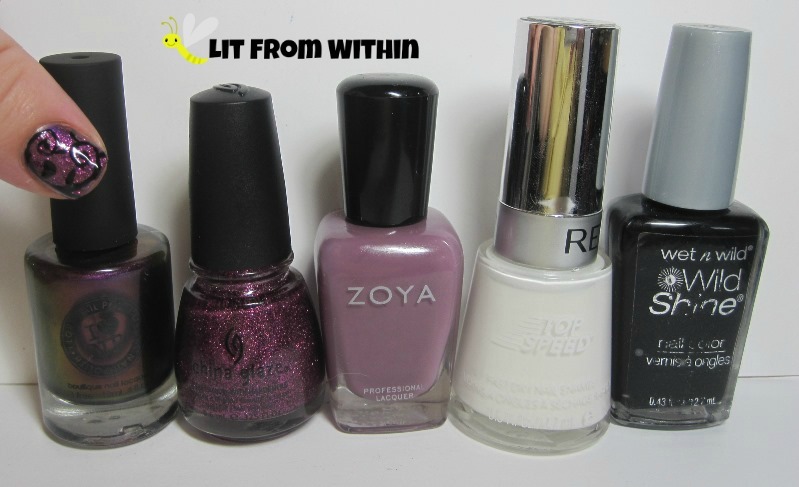 Here's the bottle shot: I Love Nail Polish Undenied, China Glaze Put A Bow On It, Zoya Odette, Revlon Spirit, and Wet 'n Wild Black Creme. There's no test, but if you do your homework, I'd love for you to post it on my Facebook page. If you liked this, and would like to see more from me, you can also find me on my blog: Lit From Within, Google+, Bloglovin', Twitter, Pinterest, and Instagram. Thanks for having me, Brigitte!